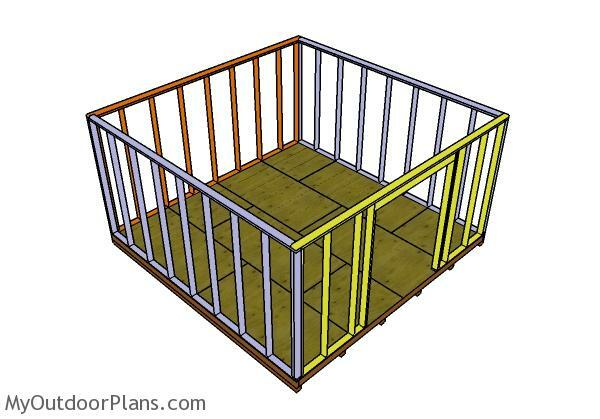 This step by step diy project is about 16×16 gambrel shed plans. I have designed this compact barn shed so you can create a lot of storage space for your tools, garden items and other things you don’t use on a regular basis. 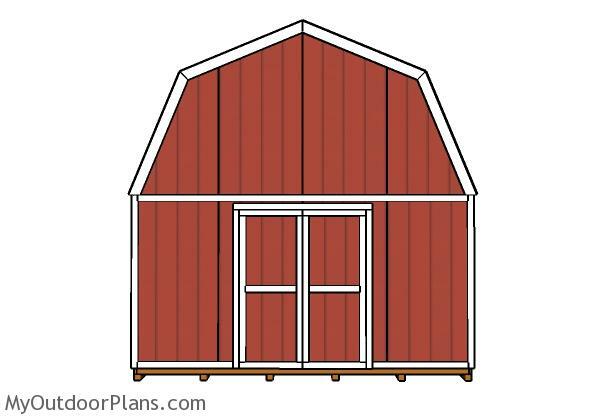 This shed features a nice design and large front doors.Take a look over the rest of my woodworking plans, if you want to get more building inspiration. The first step of the project is to build the floor frame for the barn shed. 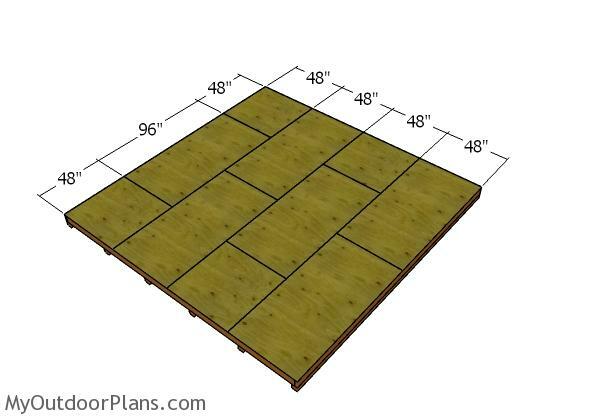 Cut the floor joists from 2×6 lumber and then lay them on a level surface. Align the edges flush and make sure the corners are square. Drill pilot holes through the rim joists and then insert 3 1/2″ screws into the perpendicular components. Make sure the corners are square and align the edges before inserting the screws. 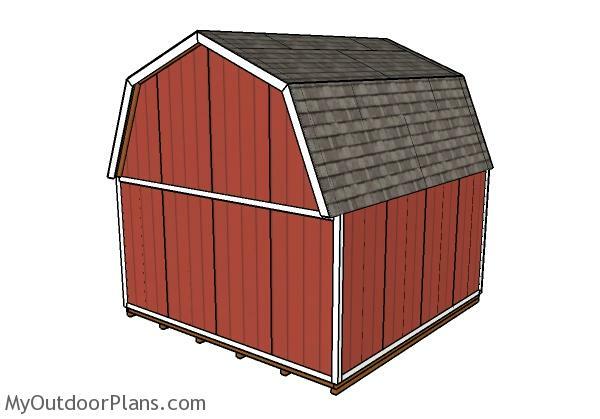 Select the location for the barn shed after reading the local building codes. Remove the vegetation layer and then level the surface thoroughly. Compact a layer of gravel on the ground and then lay the skids equally-spaced, as shown in the diagram. Use rafter ties to lock the floor frame to the skids. 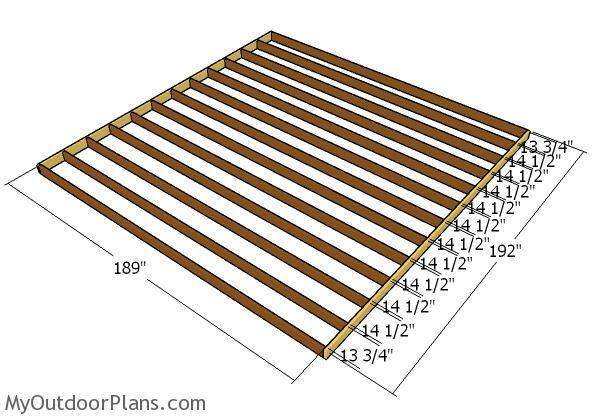 Next, you need to lay the 3/4″ plywood sheets to the floor frame. Align the edges flush and drill pilot holes. Insert the 1 5/8″ screws every 8″ along the framing, for a professional result. Leave no gaps between the sheets for a professional result. 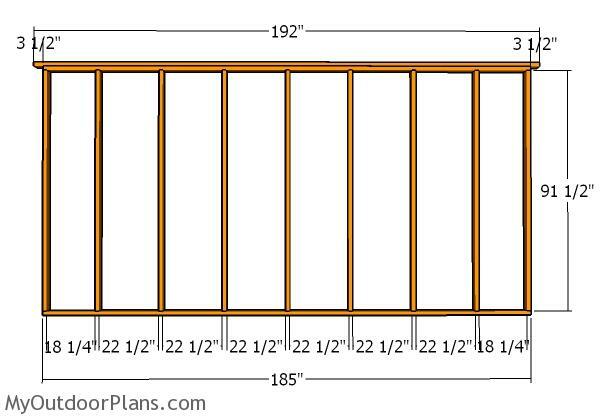 Frame the back wall for the barn shed from 2×4 lumber. Cut the components at the right dimensions, using the information from the diagram. Drill pilot holes through the plates and insert 3 1/2″ screws into the studs. Place the studs every 24″ on center. Align the edges flush and make sure the corners are square. Fit the double plate to the top of the wall and secure it into place with screws. Frame the side walls for the barn shed using the same techniques described above. Place double studs at both ends of the side walls. Fit 1/2″ plywood blockings between the double studs, for a professional result. Cut the components from 2×4 lumber for the front wall. Drill pilot holes through the plates and insert 3 1/2″ screws into the studs. Use 2×6 lumber for the double header. Fit 1/2″ plywood between the double header beams. You can adjust the size of the door opening to suit your needs. Fit the wall frames to the floor of the shed and align the edges flush. Drill pilot holes through the bottom plates and insert 3 1/2″ screws into the floor. Plumb the wall frames with a spirit level for a professional result. Moreover, you need to lock the adjacent wall together by drilling pilot holes and inserting 3 1/2″ screws. 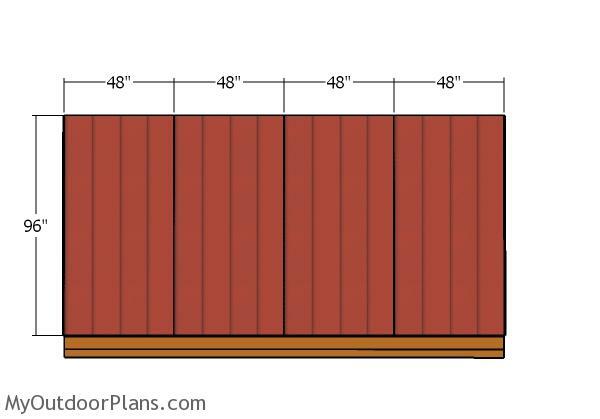 Attach T1-11 siding sheets to the sides and back of the gambrel shed. Use 6-8d nails to secure the sheets along the framing, every 8″. Leave no gaps between the sheets for a professional result. Fit the T1-11 siding sheets to the front of the shed, as well. Make the cuts so you can fit the sheets around the door opening. Align the edges flush and use 6-8d nails to lock the sheets into place tightly. Leave no gaps between the sheets for a professional result. Last but not least, you need to take care of the finishing touches. Therefore, fill the holes with wood putty and then let it dry out for several hours. Smooth the surface with 120-220 grit sandpaper and apply a few coats of paint or stain to enhance the look of the shed and to protect the components from decay. Seen from the back, the 16×16 barn shed has a nice design and appearance. 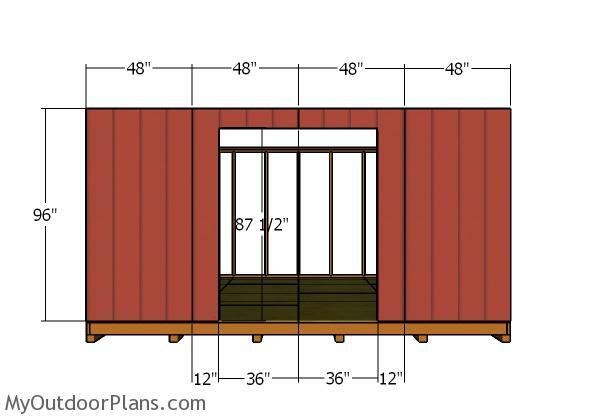 As you can easily notice in the diagram, this gambrel shed has generous overhangs. Don’t forget to take a look over PART 2 and PART 3 of the barn shed, so you learn how to build the gambrel roof and the double trims. Moreover, I will also show you how to fit the decorative doors to the front, back and sides of the barn. 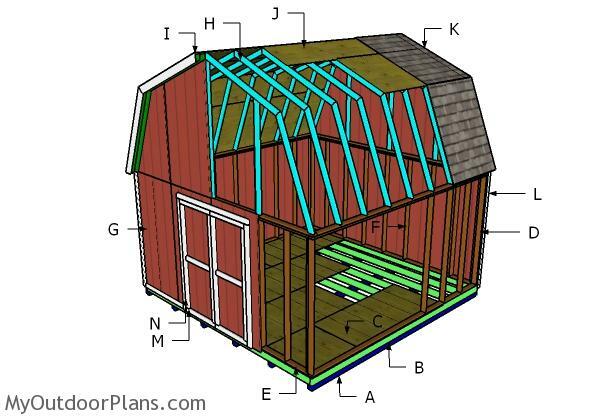 This woodworking project was about 16×16 gambrel shed plans free. If you want to see more outdoor plans, check out the rest of our step by step projects and follow the instructions to obtain a professional result. Hi. 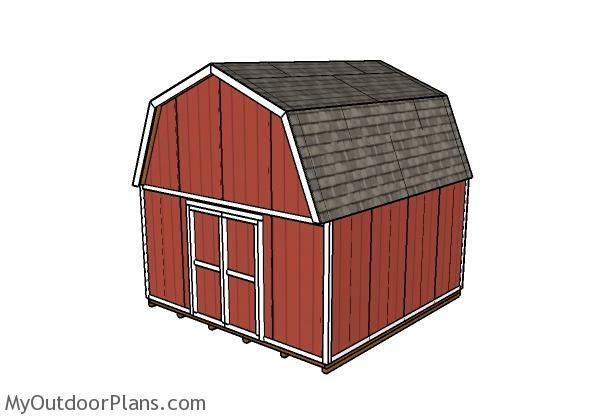 I was wondering if it’s possible to put a loft in the 16 x 16 Gambrel Shed Plan. Yes, it is possible. 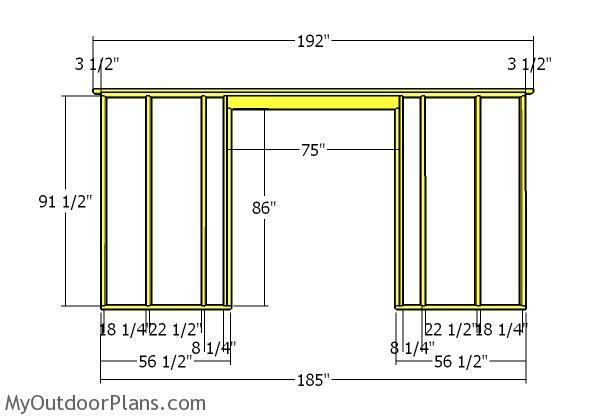 Fit support beams to the bottom of the trusses (12′ long) lock them into place tightly then fit the 3/4″ plywood floor. I am interested in a 16 x 16 foot gambriel roof shed with concrete foundation. Do you have any plans for this? 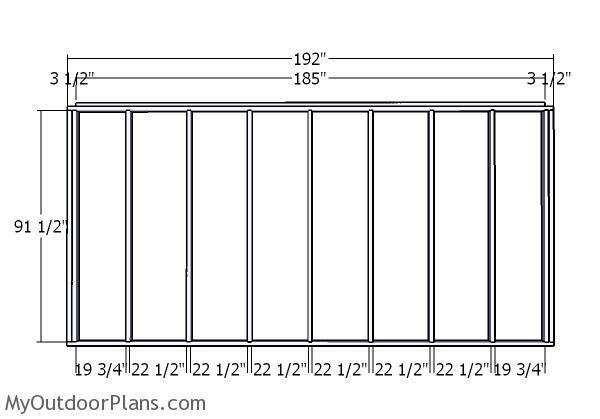 Will your plans modification app allow modifiying any of your plans to add an 8 foot roll type garage door and walk in entry type door? Can your drawings be submittted for building permit? Thanks in advance for answering my questions, your $37 offer looks good. There is no $37 offer, all my plans are free and it will stay like this. I don’t design custom plans and my plans are for informational purpose. How many rafter ties? What size screw for rafter ties? Looks like good plans but need more hardware info. .
2 ties for each rafter. 1 5/8″ screws. I wouldn’t recommend you this project if you have these kind of questions, though.